Three murderous steppers dubs on a propulsive, rat-tat-tat rhythm, combining mystical spaciousness with detail and ferocity. Angry-lion bass and smears of brass, fusillades and explosions, scares and shocks, oriental pentatonics, clattering percussion and synthy transcendence -- the business. The second mix is nastiest; the third is the wildest and most discombobulated. Letter-pressed, poly-lined sleeves. 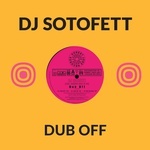 DJ Sotofett provides two tracks for So-Phat's debut release. 2018 repress. Epic, protean brilliance from the Sotofett corner, bumping nylon new age and ill chill out against reggaeton and jungle exotica, spilling batucada-style percussion workouts out of clean-heeled house. Each side introduces a new collaborator or two -- Jaakko Eino Kalevi, Thomas "Paleo's Buddy" Mende, JEKS -- Phillip Lauer from Tuff City Kids is here; Gilb'R from Versatile... The knockout punch comes with Karolin Tampere and Maimouna Haugen: "Nondo" -- "Heaven," "Eternity" -- starts out as an electro-lullaby from Côte d'Ivoire, sotto voce and abuzz, before lifting off as a zinging, anthemic, future-house classic. A real tour de force all round.